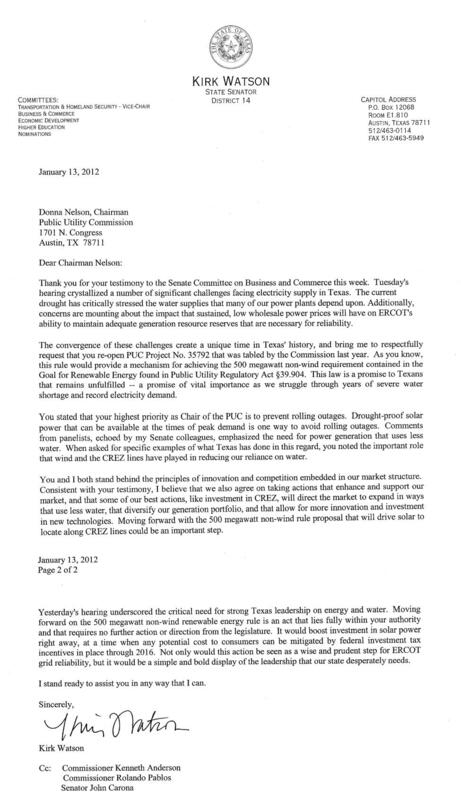 As interim legislative hearings and ERCOT workshops grapple with the drought’s anticipated stresses for Texas electric generation and reliability, Sen.Kirk Watson (D-Austin), is calling on the Texas Public Utility Commission to give solar energy a push. “You stated that your highest priority as chair of the PUC is to prevent rolling outages,”Watson wrote in a Jan. 13 letter to PUC Chair Donna Nelson, mentioning her testimony last week before the Senate Business and Commerce Committee. “Drought-proof solar power that can be available at the times of peak demand is one way to avoid rolling outages,” his letter continued. It noted that Nelson mentioned the importance of wind energy and the state’s CREZ (Competitive Renewable Energy Zones) lines in reducing the state’s reliance on water. Nelson has opposed rulemaking to promote solar energy generation as directed in a bill passed by the Texas Legislature in 2005 directing the PUC to establish a non-wind renewable energy target of 500 megawatts. Nelson, however, has said that Senate Bill 20 by Sen.Troy Fraser (R-Horseshoe Bay) during that special session was not mandatory. During a PUC meeting in December 2010, Nelson said she believed the PUC needed more direct guidance from the legislature during the spring 2011 session before moving forward. “It’s called a target,” she said, “and everyone knows a target is not mandatory. It would be my preference if we waited – forever.” When a proposed rule on the matter surfaced again last summer, the commission tabled it. In his letter, Watson took issue with Nelson’s argument that the PUC lacks legislative authority. See Sen. Watson’s letter below.